A huge thanks to everyone for making the Gladstone Park Fun Day such a wonderful day for everyone. I wish I could also thank the sun for coming out in the nick of time, which really was the icing on the cake. The feedback we got from the public was extremely happy and positive – everyone seemed to be having a really good time. The turnout was much better than I had expected and I think no one was disappointed. Special thanks to all the staff from Brent Parks services who worked non stop and were so quick so sort out generator issues, and other teething problems. Also thanks to George Irvin Snr & Jnr for bringing a really great fun fair – those water balls were one of the big hits of the day! Thanks also to Mike Evans for sorting out those rickshaws which were a huge draw. They looked great, all festooned with flowers, and were such a fantastic and popular addition to the event. The riders worked really hard and I know they worked for longer than they were supposed to, but seemed to enjoy themselves. 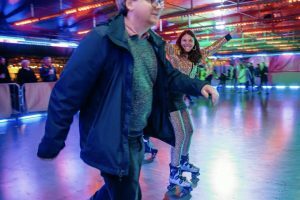 The roller skating workshops were fantastic and lots of parents told me what a brilliant organization Rolladome is – they were particularly impressed with the instructors. To Phil and Greg and all the folk at Kilburn Cosmos – thanks for getting it set up in such short time, without any fuss and for getting those kiddies laughing and running around! Thanks to Brent Play for bringing the ever popular bouncy castle which was being well bounced on, and for showing what a great service you provide. To Sally Long for bringing back the wonderful Woofstock dog show in such a short time span and making it look so easy. Also many thanks to Chris Howard for coming up trumps with the PA system which was absolutely invaluable. And not forgetting the Madhatters Theatre Co, who got big crowds with their performances and pulled out the stops for some fantastic outdoor theatre! What more did the punters need? It was exactly the kind of day that I and Martin had envisaged; something for everyone in our community. Sorry to sound like an Oscar acceptance speech but you all needed to be thanked, and it just goes to show how important, organizations like the GPCC, DHHT and Brent Arts Council, (with invaluable support from Brent Council) are, in helping to create a fantastic local community.